A leading distributor of decorative upholstery fabrics and vinyl for over 50 years to upholsterers and designers. Offering a huge number of products, the site needed a powerful eCommerce engine. With a massive selection of products, they approached Spark Logix Studios hoping for a website build that could handle all 4,000+ products, while maintaining speed and a positive user experience. The site needed a powerful eCommerce engine, and all the bells and whistles that make for a great purchasing and checkout experience. WooCommerce and the Respondo Pro Framework were up the challenge! We first began by configuring the product CSV, which had thousands of products, to ensure that these products could be directly imported into the database, rather than individually recreated. This included importing all of the images, but most importantly, the products tags and categories. 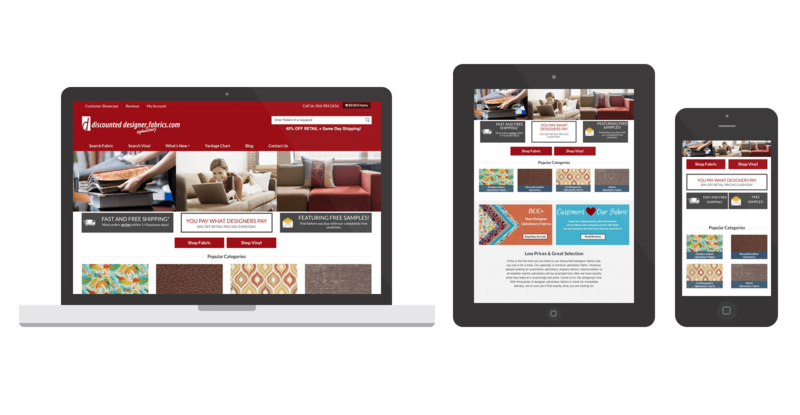 By using the custom Navigation Plugin created by Spark Logix Studios, the shop page on the website becomes easy to navigate, allowing users to search and browse through the vast number of products to find the particular pattern they are looking for. Once we had the products imported, we discovered that the current default server configuration wasn’t sufficient for the number of products. Working with the hosting company, we streamlined the code to allow the website speed to increase dramatically. So no matter the number of products in the store, the website will work perfectly, at speeds previously unthinkable with WordPress. Another amazing, custom, responsive website from Spark Logix Studios!